OK, most of the moves I make here at Harpsmith Central are downright brilliant ;o) When I blow it though, I REALLY blow it! Here’s my recent bone head moment. Serious chromatic harmonica players know that to have an optimum playing experience, with the least amount of condensation drenched wind saver issues, preheat the harmonica to at least 15c/60oF before playing. So I placed my instrument on top of my radiant electric heater--intended for just a few moments, but then became distracted by a phone call from Monster Chro Player, Jason Keene. Twenty minutes into the call, I noticed that I had forgotten to remove the harmonica off the heater! I dropped the phone and rushed over to pull my super hot harmonica off the griddle--OUCHIE (image picking up an oven baked potato). Too late--the damage was done. 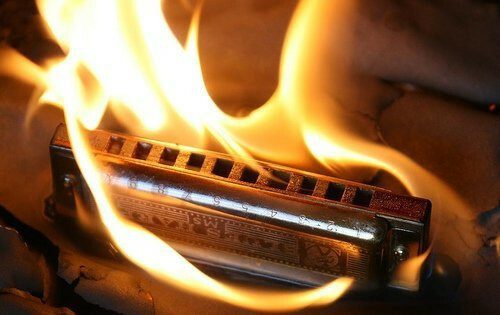 So let my bone headed event be a warning to all you Chromatic Harmonica Players--if you are going to preheat your harmonica before playing it, KEEP YOUR EYES ON IT (and set your timer). Good--now the whole harmonica universe knows!